Visit the beautiful scenery of Ontario with a Muskoka timeshare for sale at Birchcliff Villas at Deerhurst Resort. Make fond memories while enjoying your very own vacation condo, plus access to the resort’s many amenities and ease-of-access to countless nearby attractions. 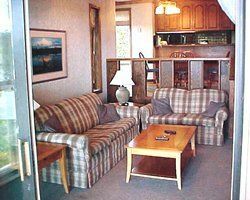 Your spacious Muskoka timeshare for sale at Birchcliff Villas at Deerhurst Resort includes all the comforts and conveniences of a true vacation home, plus much more. Enjoy a one or two-bedroom condo unit equipped with cozy furnishings and luxurious touches. Each vacation condo is inclusive of a full kitchen with dining area, spacious living room with plenty of room to entertain, wood-burning fireplace, in-unit washer and dryer, and a fully-furnished outdoor deck offering breathtaking views. Birchcliff Villas at Deerhurst Resort is the perfect spot for your Muskoka timeshare for sale, striking the perfect balance of tranquility and adventure. Winter promises opportunities for snow sports, including skiing and snowboarding at the nearby Hidden Valley Highlands Ski Area. Arrowhead Provincial Park offers four seasons of fun, with skiing in the winter months and hiking and mountain biking in the warmer months. Sugarbush Hill Maple Farm is minutes away, offering tours and samples of maple syrup. Those looking for a unique attraction, visit Group of Seven Outdoor Gallery featuring murals of the town’s history and heritage. Back at the resort, relax and unwind with family and friends. Retreat to the lake for swimming, canoeing, or kayaking. Lounge by the indoor or outdoor pool. Play a game of tennis, racquetball, or shuffleboard while making use of the many on-site sports courts. Indulge in some pampering at the full-service spa and salon, where signature massages, facials, and body treatments await. Top off each day with a meal at one of four resort restaurants, offering luxurious meals, delicious cocktails, and decadent desserts. Contact Birchcliff Villas at Deerhurst Resort Specialist Today!